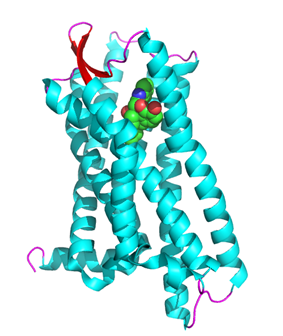 The δ-opioid receptor, also known as delta opioid receptor or simply delta receptor, abbreviated DOR, is an opioid receptor that has enkephalins as its endogenous ligands. Activation of δ receptors produces some analgesia, although less than that of mu-opioid agonists. Many δ agonists may also cause seizures at high doses, although not all δ agonists produce this effect. Evidence for whether δ agonists produce respiratory depression is mixed; high doses of the δ agonist peptide DPDPE produced respiratory depression in sheep, but in tests on mice the non-peptide δ agonist SNC-80 produced respiratory depression only at the very high dose of 40 mg/kg. In contrast both the peptide δ agonist Deltorphin II and the non-peptide δ agonist (+)-BW373U86 actually stimulated respiratory function and blocked the respiratory depressant effect of the potent μ-opioid agonist alfentanil, without affecting pain relief. It thus seems likely that while δ opioid agonists can produce respiratory depression at very high doses, at lower doses they have the opposite effect, a fact that may make mixed μ/δ agonists such as DPI-3290 potentially very useful drugs that might be much safer than the μ agonists currently used for pain relief. Of additional interest is the potential for δ agonists to be developed for use as a novel class of antidepressant drugs, following robust evidence of both antidepressant effects and also upregulation of BDNF production in the brain in animal models of depression. These antidepressant effects have been linked to endogenous opioid peptides acting at δ and μ opioid receptors, and so can also be produced by enkephalinase inhibitors such as RB-101. Recent work indicates that exogenous ligands that activate the δ receptors mimic the phenomenon known as ischemic preconditioning. Experimentally, if short periods of transient ischemia are induced the downstream tissues are robustly protected if longer-duration interruption of the blood supply is then effected. Opiates and opioids with δ activity mimic this effect. In the rat model, introduction of δ active ligands results in significant cardioprotection. Until comparatively recently, there were few pharmacological tools for the study of δ receptors. As a consequence, our understanding of their function is much more limited than those of the other opioid receptors for which selective ligands have long been available. 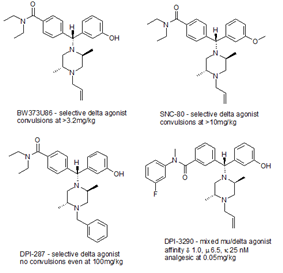 However there are now several selective δ opioid agonists available, including peptides such as DPDPE and deltorphin II, and non-peptide drugs such as SNC-80, the more potent (+)-BW373U86, a newer drug DPI-287, which does not produce the problems with convulsions seen with the earlier agents, and the mixed μ/δ agonist DPI-3290, which is a much more potent analgesic than the more highly selective δ agonists. Selective antagonists for the δ receptor are also available, with the best known being the opiate derivative naltrindole. δ−opioid receptors have been shown to interact with β2 adrenergic receptors, arrestin β1 and GPRASP1. ^ Quock RM, Burkey TH, Varga E, Hosohata Y, Hosohata K, Cowell SM, Slate CA, Ehlert FJ, Roeske WR, Yamamura HI (1999). "The delta-opioid receptor: molecular pharmacology, signal transduction, and the determination of drug efficacy". Pharmacol. Rev. 51 (3): 503–32. ^ Varga EV, Navratilova E, Stropova D, Jambrosic J, Roeske WR, Yamamura HI (2004). "Agonist-specific regulation of the delta-opioid receptor". Life Sci. 76 (6): 599–612. ^ Jutkiewicz EM, Baladi MG, Folk JE, Rice KC, Woods JH (2006). "The convulsive and electroencephalographic changes produced by nonpeptidic delta-opioid agonists in rats: comparison with pentylenetetrazol". J. Pharmacol. Exp. Ther. 317 (3): 1337–48. ^ Clapp JF, Kett A, Olariu N, Omoniyi AT, Wu D, Kim H, Szeto HH (1998). "Cardiovascular and metabolic responses to two receptor-selective opioid agonists in pregnant sheep". Am. J. Obstet. Gynecol. 178 (2): 397–401. ^ Gallantine EL, Meert TF (2005). "A comparison of the antinociceptive and adverse effects of the mu-opioid agonist morphine and the delta-opioid agonist SNC80". Basic Clin. Pharmacol. Toxicol. 97 (1): 39–51. ^ Su YF, McNutt RW, Chang KJ (1998). "Delta-opioid ligands reverse alfentanil-induced respiratory depression but not antinociception". J. Pharmacol. Exp. Ther. 287 (3): 815–23. ^ Broom DC, Jutkiewicz EM, Rice KC, Traynor JR, Woods JH (2002). "Behavioral effects of delta-opioid receptor agonists: potential antidepressants?". Jpn. J. Pharmacol. 90 (1): 1–6. ^ Torregrossa MM, Jutkiewicz EM, Mosberg HI, Balboni G, Watson SJ, Woods JH (2006). "Peptidic delta opioid receptor agonists produce antidepressant-like effects in the forced swim test and regulate BDNF mRNA expression in rats". Brain Res. 1069 (1): 172–81. ^ Zhang H, Torregrossa MM, Jutkiewicz EM, Shi YG, Rice KC, Woods JH, Watson SJ, Ko MC (2006). "Endogenous opioids upregulate brain-derived neurotrophic factor mRNA through delta- and micro-opioid receptors independent of antidepressant-like effects". Eur. J. Neurosci. 23 (4): 984–94. ^ Jutkiewicz EM, Torregrossa MM, Sobczyk-Kojiro K, Mosberg HI, Folk JE, Rice KC, Watson SJ, Woods JH (2006). "Behavioral and neurobiological effects of the enkephalinase inhibitor RB101 relative to its antidepressant effects". Eur. J. Pharmacol. 531 (1-3): 151–9. ^ Zhang J, Qian H, Zhao P, Hong SS, Xia Y (2006). "Rapid hypoxia preconditioning protects cortical neurons from glutamate toxicity through delta-opioid receptor". Stroke 37 (4): 1094–9. ^ Guo L, Zhang L, Zhang DC (2005). "[Mechanisms of delta-opioids cardioprotective effects in ischemia and its potential clinical applications]". Sheng li ke xue jin zhan [Progress in physiology] (in Chinese) 36 (4): 333–6. ^ Calderon SN, Rothman RB, Porreca F, Flippen-Anderson JL, McNutt RW, Xu H, Smith LE, Bilsky EJ, Davis P, Rice KC (1994). "Probes for narcotic receptor mediated phenomena. 19. Synthesis of (+)-4-[(alpha R)-alpha-((2S,5R)-4-allyl-2,5-dimethyl-1-piperazinyl)-3- methoxybenzyl]-N,N-diethylbenzamide (SNC 80): a highly selective, nonpeptide delta opioid receptor agonist". J. Med. Chem. 37 (14): 2125–8. ^ Calderon SN, Rice KC, Rothman RB, Porreca F, Flippen-Anderson JL, Kayakiri H, Xu H, Becketts K, Smith LE, Bilsky EJ, Davis P, Horvath R (1997). "Probes for narcotic receptor mediated phenomena. 23. Synthesis, opioid receptor binding, and bioassay of the highly selective delta agonist (+)-4-[(alpha R)-alpha-((2S,5R)-4-Allyl-2,5-dimethyl-1-piperazinyl)-3-methoxybenzyl]- N,N-diethylbenzamide (SNC 80) and related novel nonpeptide delta opioid receptor ligands". J. Med. Chem. 40 (5): 695–704. ^ Jutkiewicz EM (2006). "The antidepressant -like effects of delta-opioid receptor agonists". Mol. Interv. 6 (3): 162–9. ^ Ananthan S (2006). "Opioid ligands with mixed mu/delta opioid receptor interactions: an emerging approach to novel analgesics". AAPS J 8 (1): E118–25. ^ Portoghese PS, Sultana M, Takemori AE (1988). "Naltrindole, a highly selective and potent non-peptide delta opioid receptor antagonist". Eur. J. Pharmacol. 146 (1): 185–6. ^ Le Bourdonnec B, Windh RT, Ajello CW, Leister LK, Gu M, Chu GH, Tuthill PA, Barker WM, Koblish M, Wiant DD, Graczyk TM, Belanger S, Cassel JA, Feschenko MS, Brogdon BL, Smith SA, Christ DD, Derelanko MJ, Kutz S, Little PJ, DeHaven RN, DeHaven-Hudkins DL, Dolle RE (October 2008). "Potent, orally bioavailable delta opioid receptor agonists for the treatment of pain: discovery of N,N-diethyl-4-(5-hydroxyspiro[chromene-2,4'-piperidine]-4-yl)benzamide (ADL5859)". Journal of Medicinal Chemistry 51 (19): 5893–6. ^ McVey M, Ramsay D, Kellett E, Rees S, Wilson S, Pope AJ, Milligan G (Apr 2001). "Monitoring receptor oligomerization using time-resolved fluorescence resonance energy transfer and bioluminescence resonance energy transfer. The human delta -opioid receptor displays constitutive oligomerization at the cell surface, which is not regulated by receptor occupancy". J. Biol. Chem. 276 (17): 14092–9. ^ Cen B, Yu Q, Guo J, Wu Y, Ling K, Cheng Z, Ma L, Pei G (Mar 2001). "Direct binding of beta-arrestins to two distinct intracellular domains of the delta opioid receptor". J. Neurochem. 76 (6): 1887–94. ^ Whistler JL, Enquist J, Marley A, Fong J, Gladher F, Tsuruda P, Murray SR, Von Zastrow M (Jul 2002). "Modulation of postendocytic sorting of G protein-coupled receptors". Narita M, Funada M, Suzuki T (2001). "Regulations of opioid dependence by opioid receptor types.". Pharmacol. Ther. 89 (1): 1–15. Evans CJ, Keith DE, Morrison H, et al. (1993). "Cloning of a delta opioid receptor by functional expression.". Science 258 (5090): 1952–5. Offermanns S, Schultz G, Rosenthal W (1991). "Evidence for opioid receptor-mediated activation of the G-proteins, Go and Gi2, in membranes of neuroblastoma x glioma (NG108-15) hybrid cells.". J. Biol. Chem. 266 (6): 3365–8. Simonin F, Befort K, Gavériaux-Ruff C, et al. (1995). "The human delta-opioid receptor: genomic organization, cDNA cloning, functional expression, and distribution in human brain.". Mol. Pharmacol. 46 (6): 1015–21. Befort K, Mattéi MG, Roeckel N, Kieffer B (1994). "Chromosomal localization of the delta opioid receptor gene to human 1p34.3-p36.1 and mouse 4D bands by in situ hybridization.". Genomics 20 (1): 143–5. Knapp RJ, Malatynska E, Fang L, et al. (1994). "Identification of a human delta opioid receptor: cloning and expression.". Life Sci. 54 (25): PL463–9. Georgoussi Z, Carr C, Milligan G (1993). "Direct measurements of in situ interactions of rat brain opioid receptors with the guanine nucleotide-binding protein Go.". Mol. Pharmacol. 44 (1): 62–9. Bzdega T, Chin H, Kim H, et al. (1993). "Regional expression and chromosomal localization of the delta opiate receptor gene.". Proc. Natl. Acad. Sci. U.S.A. 90 (20): 9305–9. Ho MK, Wong YH (1997). "Functional role of amino-terminal serine16 and serine27 of G alphaZ in receptor and effector coupling.". J. Neurochem. 68 (6): 2514–22. Hedin KE, Bell MP, Kalli KR, et al. (1998). "Delta-opioid receptors expressed by Jurkat T cells enhance IL-2 secretion by increasing AP-1 complexes and activity of the NF-AT/AP-1-binding promoter element.". J. Immunol. 159 (11): 5431–40. Jordan BA, Devi LA (1999). "G-protein-coupled receptor heterodimerization modulates receptor function.". Nature 399 (6737): 697–700. Petaja-Repo UE, Hogue M, Laperriere A, et al. (2000). "Export from the endoplasmic reticulum represents the limiting step in the maturation and cell surface expression of the human delta opioid receptor.". J. Biol. Chem. 275 (18): 13727–36. Gelernter J, Kranzler HR (2000). "Variant detection at the delta opioid receptor (OPRD1) locus and population genetics of a novel variant affecting protein sequence.". Hum. Genet. 107 (1): 86–8. Guo J, Wu Y, Zhang W, et al. (2000). "Identification of G protein-coupled receptor kinase 2 phosphorylation sites responsible for agonist-stimulated delta-opioid receptor phosphorylation.". Mol. Pharmacol. 58 (5): 1050–6. Gomes I, Jordan BA, Gupta A, et al. (2001). "Heterodimerization of mu and delta opioid receptors: A role in opiate synergy.". J. Neurosci. 20 (22): RC110. Xu W, Chen C, Huang P, et al. (2000). "The conserved cysteine 7.38 residue is differentially accessible in the binding-site crevices of the mu, delta, and kappa opioid receptors.". Biochemistry 39 (45): 13904–15. Hartley JL, Temple GF, Brasch MA (2001). "DNA cloning using in vitro site-specific recombination.". Genome Res. 10 (11): 1788–95. Saeed RW, Stefano GB, Murga JD, et al. (2001). "Expression of functional delta opioid receptors in vascular smooth muscle.". Int. J. Mol. Med. 6 (6): 673–7. Xiang B, Yu GH, Guo J, et al. (2001). "Heterologous activation of protein kinase C stimulates phosphorylation of delta-opioid receptor at serine 344, resulting in beta-arrestin- and clathrin-mediated receptor internalization.". J. Biol. Chem. 276 (7): 4709–16. Yeo A, Samways DS, Fowler CE, et al. (2001). "Coincident signalling between the Gi/Go-coupled delta-opioid receptor and the Gq-coupled m3 muscarinic receptor at the level of intracellular free calcium in SH-SY5Y cells.". J. Neurochem. 76 (6): 1688–700. "Opioid Receptors: δ". IUPHAR Database of Receptors and Ion Channels. International Union of Basic and Clinical Pharmacology.